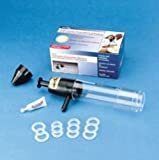 New – Encore Manual Vacuum Erection Device | Medical Supplies and Equipment. Vacuum Therapy – Recommended by the American Urology Association The Encore Vacuum Erection Device (VED) is capable of restoring sexual function in up to 90% of impotent men. As a non-invasive and low cost option to chemical and surgical procedures to treat impotence, vacuum therapy provides a relatively high probability of a successful erection and is ideal therapy for treating erectile dysfunction. Vacuum therapy with the use of the Encore system can produce penile rigidity for as much as thirty minutes. Includes manual pump and 4 different size rings with ring loading applicator, lubricant, discrete carrying case plus an instruction book. Do not buy this product or from this seller. They have misrepresented the performance of this product. This product caused me such severe pain that I had to go to my doctor. He said this device is dangerous, and that I should to throw it away. No where does it say that item ASIN: B001A3JQC4 is not returnable.